Light, colorful and fun! Unit 806 is a premium unit on a highly sought after floor of the building (not too low and not too high). 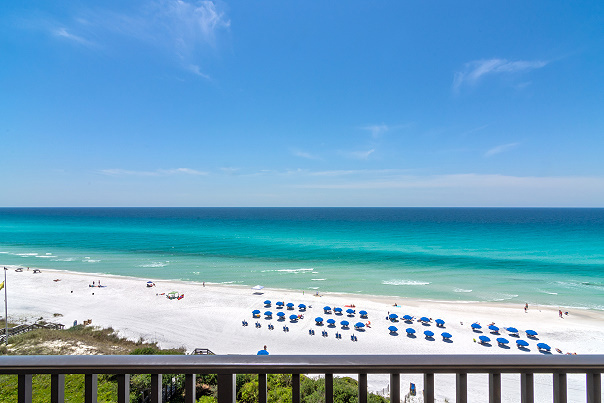 Our unit has tremendous, two-way balcony views up and down the gorgeous Emerald Coast beach -- all the way from Panama City to Destin -- while at the same time allowing you to view the sand while sitting on the couch in the living room. 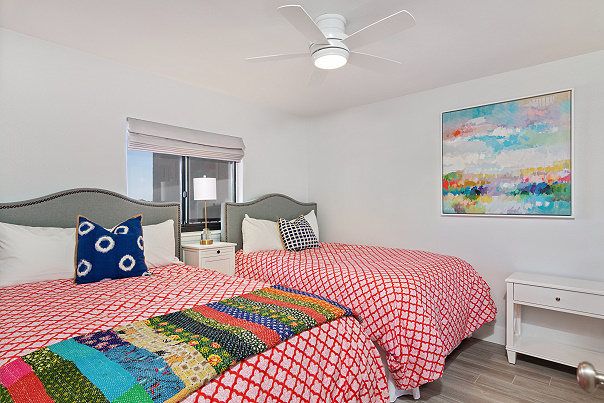 Unit 806 was completely remodeled in Spring 2018 and furnished with your comfort in mind. 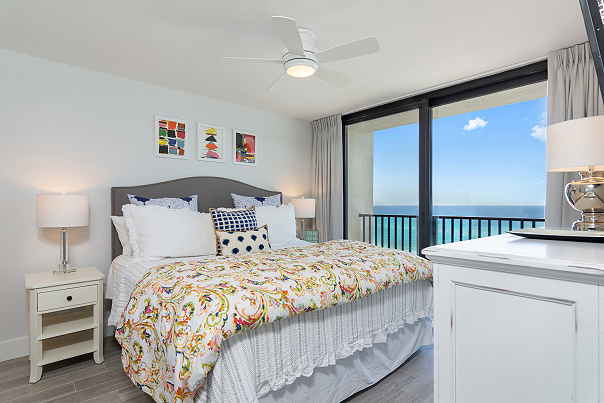 Ranked as having one of the top finish-outs of any unit in the building, the unit has all new floors, new doors, new hardware, new bathrooms, new fixtures, new kitchen and bathroom appliances, new furniture, new TVs, and all new bedding as part of the renovation. 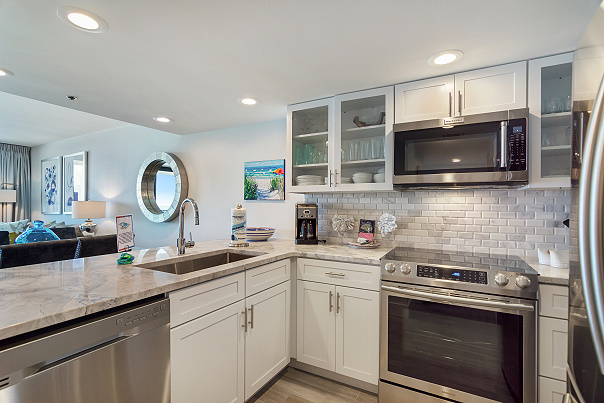 The expanded kitchen has a modern design with quartzite countertop, stainless steel appliances, new lighting, and custom cabinetry. The kitchen is fully equipped and the unit includes a full size washer/dryer. The master bedroom has a king sized bed and the guest room has two double beds. Both bathrooms have new tile and multi-drawered vanities (with hair dryers) with a walk in shower in the master and a tub/shower combination in the guest bath. 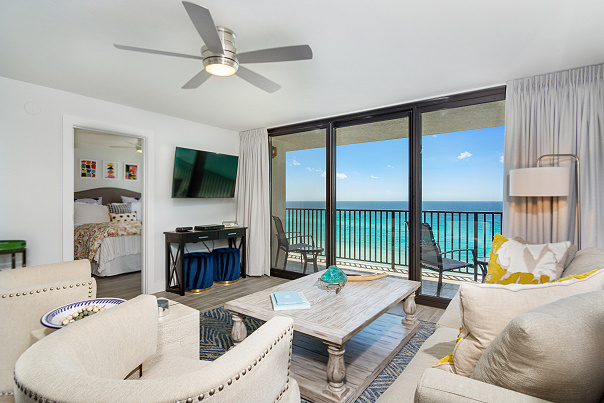 There are three flat screen TVs mounted in the unit -- a 50" TV in the living room, a 40" TV in the master bedroom, and a 32" TV in the guest room. 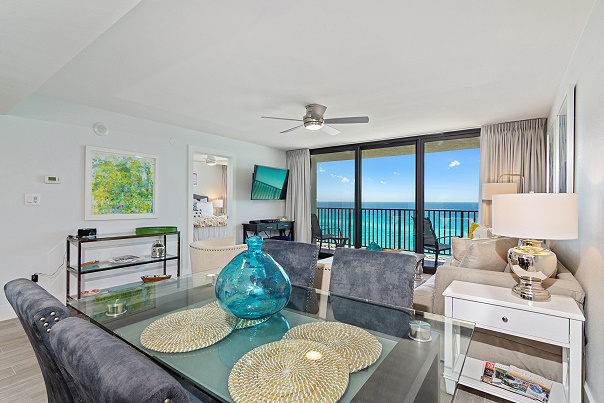 Unit 806 comes with complimentary WiFi and Beach Chair set-up (seasonal).. One week minimal rental, Saturday to Saturday (June to mid-August). Please make sure to browse all 40 pictures of our unit that are available by clicking through the link below entitled "click to take virtual tour of this unit." Hopefully, you will like what you see and select our unit for your next vacation.